REALLY AMERICA, YOU WANT TO ELECT A PARTY INTO POWER THAT ENDORSES ANTIFA? From Powerline comes the chilling reality that Democrats actually endorse an organization that promotes polity violence. That is correct, Rep. Keith Ellison (D-MI) endorsed Antifa. Take a good look what the Democrat party has become. Antifi should be considered a domestic terror organization, not endorsed by U.S. Representatives. Antifa is the moral equivalence of Neo-Nazi’s; however, much worse. They actually have support of members of Congress. Ellison tweeted: At @MoonPalaceBooks and I just found the book that strike [sic] fear in the heart of @realDonaldTrump. If you sometimes get the feeling that the Democratic Party has gone mad, you’re right. It has. Exhibit A is Keith Ellison, deputy chairman of the Democratic National Committee, who yesterday endorsed the fascist Antifa movement, which closely resembles the Brownshirts of the 1930s. 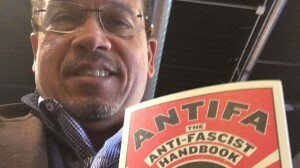 Ellison tweeted this photo of himself with Antifa’s manifesto. And to make matters worse you have the liberal media backing the play of this misguided member of Congress in Newsweek trying to spin for Ellison. The hacks at Newsweek want to defend Antifa and call all those who would oppose any type of violence, the alt-right. Seriously? This is shameful. So some how its a bad thing to be against an organization that promotes political violence? Does this mean that the liberal and bias MSM will defend the Neo-Nazi’s as well? What’s the difference? His father is shocked by the allegations and believes his son may be suffering from PTSD from his tours overseas. According to his military service record, Ikaika Kang was deployed to Iraq in 2010, and served in Afghanistan in 2014. An active duty Hawaii soldier who was arrested for allegedly trying to provide material support and training to the Islamic State told an undercover federal agent Saturday that he wanted to kill “a bunch of people. A criminal complaint alleges that Ikaika Erik Kang, 34, was arrested at his Waipahu apartment Saturday, shortly after pledging his loyalty to ISIS and making the threatening statement. “A probable cause arrest was made in the interest of public safety,” Honolulu FBI Special Agent in Charge Paul D. Delacourt said Monday, after Kang’s first appearance in federal court. Eric Trump, the second oldest son of Republican presidential candidate Donald Trump, was sent a letter in the mail that contained a white powdery substance and a threatening letter. Really folks, this sent by the same people who claims that Donald Trump uses violent and inflammatory rhetoric on the campaign trail. But terroristic threats and activities are perfectly okay, right? The Police and FBI are investigating the suspicious letter that was post marked from Massachusetts. I don’t care what you think of some body, this should be denounced by all and those responsible arrested and prosecuted. Donald Trump calls for the total and complete shutdown of Muslims entering the United States until our country’s representatives can figure out what is going on. Whether this is Constitutional or not is one thing, but Trump’s comments have the LEFT and the establishment GOP’s hearts a flutter. But the real question is whether this kind of sentiment resonates with the people. Americans are more and more tired of the PC and do nothing, go along to get along policies of both parties that have America less safe. One thing is for certain, if Obama wants to make the reference to common sense gun control, I believe We the People are calling for common sense immigration and border control and the proper vetting of individuals coming into the US. Before you listen to how his comments are spun in the media, take a listen below and you decide. until our country’s representatives can figure out what the hell is going on. UPDATE I: Ted Cruz: I Would Not Ban All Muslims from Entering the Country. Al Qaeda can control a substantial amount of territory. And the reason is that’s where the threat is coming from,” Cruz said. UPDATE II: Trump spokesman Corey Lewandowski confirmed to the AP that the proposal would apply to Muslims who are tourists as well as those seeking immigration visas.